It's probably a little late to be posting this now, seeing as World Book Day was yesterday, but it's pretty interesting news. A recently-discovered portrait believed to be of Jane Austen (pictured left) is to go on display at Oxford's Bodleian Library to celebrate World Book Day. The portrait will be displayed on 1 March alongside an example of the Pride and Prejudice author's needlework. The fragile needlework sampler, made by Austen aged 12, is part of a private collection in Gloucestershire. The free one-day exhibition will also include manuscripts from the Bodleian Library's collection. Visitors will be able to view a newly-acquired handwritten manuscript of her unfinished novel, The Watsons. 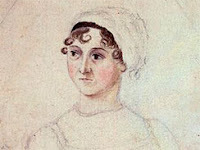 The manuscript shows extensive revisions and corrections and is described by Oxford University as "a testimony of Jane Austen's efforts to give shape to the earliest ideas as they pour on to paper, as she reviews, revises, deletes and underscores". Also included in the display will be Volume the First, a manuscript of Austen's juvenilia. There are currently just two recognised portraits of Austen. 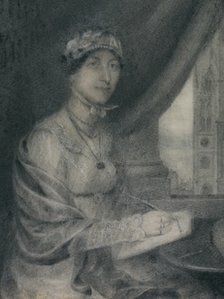 Only one portrait of the author has never been contested, the portrait sketched by Austen's sister Cassandra in 1810. The portrait which will be displayed at the Bodleian was unearthed by British author Dr Paula Byrne. 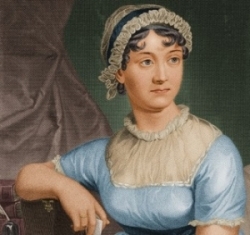 She was given it by her husband and said she recognised the long, straight "Austen nose". The pencil drawing on vellum is inscribed "Miss Jane Austin" on the back. Dr Byrne said that "apart from the striking family resemblance", this was the first clue as to the identity of the sitter. It's a shame I missed this! I did get to see the Volume the First and The Watsons manuscripts during the Treasures of the Bodleian exhibition last year, but it would have been fantastic to see some of her needlework this time around. As for the portrait, well, personally, I don't think it looks much like any of the other portraits of her that I've seen (like the one on the right which was sketched by her sister, Cassandra). Could it be Jane? What do you think of it?